As one might expect, Danish kids are exposed to a cycling life from an early age, especially in the cities. Every day of the week you'll see parents cycling with their kids on the bike lanes.Kids as young as 4 or 5. The father above is doing what is recommended in Copenhagen. Riding on the outside of the bike lane, with the kid closest to the curb. 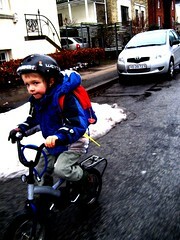 He shouldn't, however, ride ahead of the child - it is best if he pulls in behind him if another bike wants to overtake. With that said, this photo was taken early Sunday morning and there were few bikes. Just people heading down to a bakery for fresh bread. The Danish Road Safety Council has various recommendations regarding all aspects of traffic. It is generally recommended that a child only rides their bike on quiet roads if they have a tendency to weave back and forth. When they're able to ride in straight line, many parents will get them onto the bike lanes as soon as possible. The earlier the better, in order to get them familiar with being a part of the traffic. The general rule of thumb is that kids shouldn't ride alone in traffic until they are about eight. First between the ages of five and seven years are kids capable of concentrating on traffic, for short periods of time. They can use crosswalks and are able to rate clearly dangerous situations. Many kids this age can ride on roads/bike lanes with light traffic. It is important that they can ride in a straight line and that they can use their brakes. The better they are at cycling, the more they can concentrate on the traffic. Between the ages of eight and ten, kids are capable of riding alone to school. They have enough experience to rate dangers in the traffic. It is best if the route is familiar to them and the traffic is light. It's all individual, of course. I was on the bike lanes with my son up to his fourth birthday, complete with training wheels. When he learned to ride shortly after he turned four, we soon took the training wheels off and he hasn't looked back since. Get them started early... they'll be on their bikes the rest of their lives.